It’s been over a month since the Facebook page “Lizzie Borden’s Maplecroft” has revealed an update of the renovation progress or information on planned opening date for tours. It is still most likely the residence where Lizzie lived the entire second half of her life will NOT be operated as a Bed & Breakfast as first indicated by Kristee Bates. While curators Rebello and Pavao have been on the hunt for furniture, fixtures and artifacts associated with the home during the period Lizzie lived there (1893-1927), they have yet to discover and acquire items with the “Wow” factor, such as the bed in which Lizzie died. Unlike 92 Second Street, the Lizzie Borden Bed & Breakfast Museum, where the murders of Andrew and Abby Borden took place on August 4, 1892, there is not one fixed date of historical significance at 306 French Street. Lizzie lived there for 35 years but only 12 with her sister, Emma (1893-1905). So will the furnishings depict that period or post Emma? Will it depict furnishings and artifacts of the elderly Lizzie? Styles in home decor differed greatly from the mid and late 1890’s as cultural shifts in society changed from the Edwardian era to World War I to the Jazz Age. Definitely a curating – let alone a seek and obtain – challenge. One of the basic tenants of marketing an event is to build excitement. If the event is to draw attention and excitement about a future tourist attraction, titillating “teasers” are essential. No doubt whenever the opening, there will be significant local interest. Local media reporting will feed into the regional news, but with ongoing good marketing appeal would extend to national and international interest. And our treasured Lizzie Borden and her story is not landlocked within our own shores. Early on in Ms. Bates renovation endeavors she sent me nearly a dozen short videos of her sweat equity. From the “steeple” room where she plans (planned?) to have “tarot card readings”, to the 3rd floor (attic, i.e., servant’s quarters), to kitchen, to basement, to enclosed porch “where I’ll serve tea and crumpets” these videos show exactly what was being done and explained by Kristee herself. IF YOU WOULD LIKE TO SEE THESE VIDEOS, EMAIL ME AND I’LL SEND THEM TO YOU. There are those who do not think “Maplecroft” will open to the public at all. Perhaps it will be a seasonal thing and for tours only. Whatever the use it should be marketed effectively. The Lizzie Borden B&B Museum is self-marketing – Maplecroft is not. Since improved images of a letter written to Frances Willard dated July 23, 1893, have been posted on the Frances Willard House Museum website, I can provide a translation. Frances Elizabeth Caroline Willard (1839-1898) was an American educator, temperance reformer, and women’s suffragist. Her influence was instrumental in the passage of the Eighteenth and Nineteenth Amendments to the United States Constitution. Here’s some fun stuff to play around with via Bing Aerial Maps. Be sure to note other Fall River locations to the left. This is 230 Second Street, Fall River, Ma. ; otherwise known as 92 Second Street, otherwise known as The Lizzie Borden Bed and Breakfast Museum. This aerial image was taken in around 2001-2002, My Fall River Lizzie friends and Lizzie Borden case experts will be able to name everything shown here in a two block radius – and maybe more. Lizzie lived here from the time she was 12 in 1872 until after her Acquittal in July, 1893. Built by Southard Miller in 1845, the house has remained in the same location and virtually unchanged for nearly 170 years. Since this aerial was taken, however, the house has changed ownership, been painted green, the L-shape Leary Press has been demolished, the bus terminal directly across the street has been relocated and an architectural monstrosity known as the Superior Court towers in its place, Subtle symmetry? Perhaps. Shown here is the French Street home, (otherwise known as “Maplecroft”) that Lizzie and her sister moved into several weeks after her acquittal in 1893. This aerial was taken around 2001-2002. The house in the bottom of the frame, partially cut off, was also owned by Lizzie and is now owned by Michael Brimbau (author of Girl With the Pansy Pin). Stefani Koorey, Mr. Brimbau’s girlfriend, moved in to this house in 2006, Interestingly, neither one have ever been inside “Maplecroft”, which has been owned by Robert Dube’ since 1980. Lizzie lived here the entire second half of her life until she died in 1927. Lifetime Movie Channel on Lizzie Borden Got The Most Obscure Thing Right! 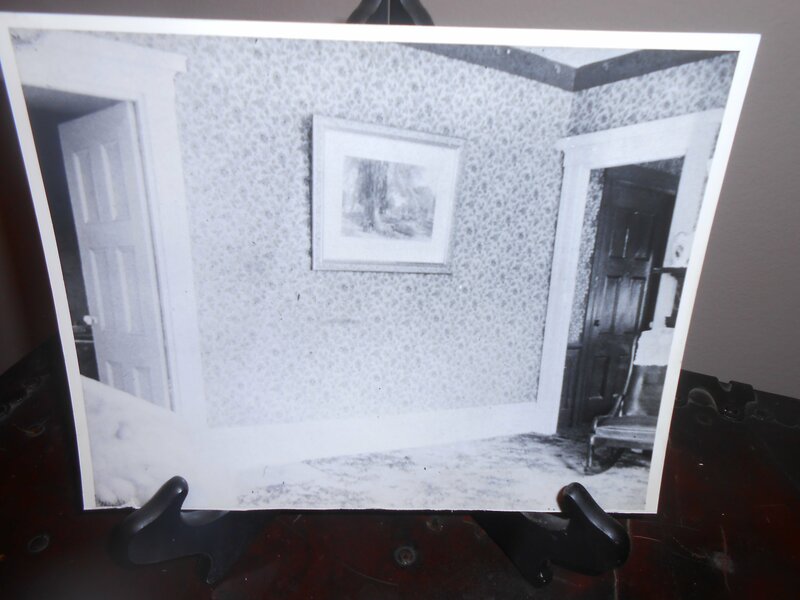 While the poor reviews and commentary on the gawd-awful Lifetime Movie Channel’s Lizzie Borden Took An Axe (see my earlier post) starring Christina Ricci continue, I have to report on a most singular and obscure thing they DID get right: The picture above the sofa where Andrew Borden met his fate. 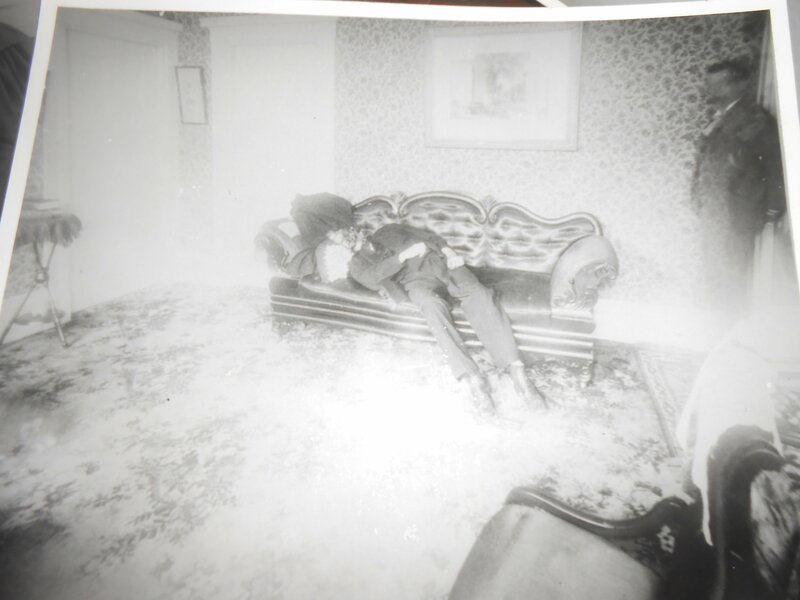 This image was also taken on August 4rh, 1892, after the sofa had been removed. There never was any mention of this picture in any of the source documents, newspapers or subsequent books written on the case. Apparently, never worthy of citing, it wasn’t nearly as notable as the sofa – which has been referred to as a “horsehair sofa of the Civil War era”. But the picture has never raised an eyebrow nor an inkling of curiosity. What that picture was remained unknown for 108 years. 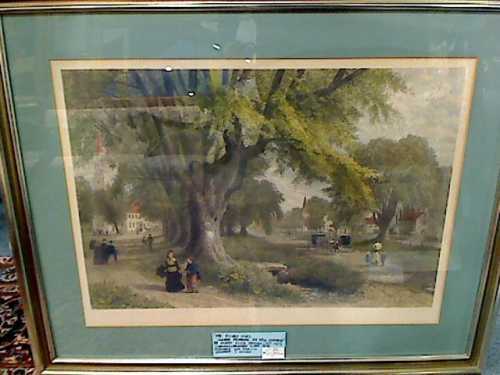 In early 2000, Lizzie Borden expert Leonard Rebello, a Fall River native and author of Lizzie Borden Past & Present (1999) conducted some in-depth research and discovered it was a steel engraving called “The Village Elms – Sunday Morning in New England” by a rather prolific painter, Albert Fitch Bellows (1829-1883). For the first time ever, EVER, the “picture above the sofa” was identified in print with the publication of the April 2000 issue (Vol. VII, #2) of the most excellent The Lizzie Borden Quarterly published by Martin F. Bertolet. Lizzie Borden enthusiasts who subscribed to this august publication, were the first to learn of this discovery. To my knowledge, there has never been any other feature article or any reference to this engraving – in context with the Lizzie Borden case – ever written about since. 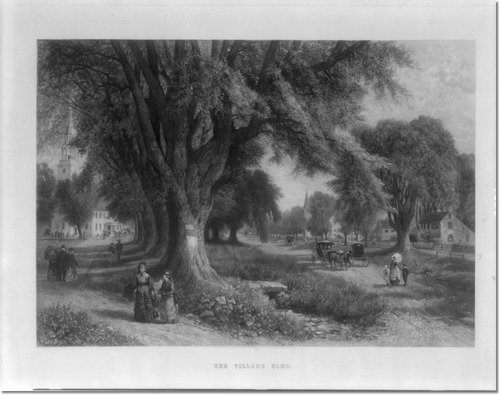 A print of this engraving has hung above the sofa at the Lizzie Borden Bed & Breakfast since Mr. Rebello’s discovery. One can readily see this exact picture hanging above the sofa in the Lifetime Movie Channel’s film which first aired on January 25, 2014, nearly 14 years after the identification of the what and who first came to light. So who, I ponder, in the production of this pitiful portrayal of the case was responsible for bringing that piece of historical accuracy to the film? Who did the research? How did they learn of the picture? (Perhaps it was Lee-ann Wilber, manager of the Lizzie Borden Bed & Breakfast, who had been contacted about “borrowing” the sofa). Nonetheless, they got the sofa wrong but the picture is correct. They got most everything wrong but they got the picture right. A most obscure inclusion with absolutely no relevancy to the case itself. If they troubled to research that and incorporate it into the film, why leave out so much that WAS relevant? While it can now be said they got something right, that singular and obscure find still lacks sufficiency for redemption of all they got wrong. Albert Fitch Bellows. The Village Elms And now you know.